Today malware is big business for cyber criminals. The availability of exploitation kits, malware-as-a-service, rogue anti-malware software (AKA “scareware”), and other tools have made it too easy for unscrupulous individuals and criminal groups to infiltrate home and business computers and networks. Faced with the increasing sophistication of these threats, even the savviest computer users are getting infected. It’s no wonder, then, that consumers and businesses alike are skittish about anything they are asked to download from the Internet. Whether it’s the latest version of a software application or a browser plug-in that enhances the user experience, users are being told to be vigilant about defending themselves against downloading potentially malicious software. The malware threat and resulting lack of confidence on the part of online users puts software developers and other companies that rely on software downloads at risk. Obviously, these threats can have a major impact on profits as fewer people purchase or download software – with relatively new and unknown brands being particularly vulnerable. Potentially even more devastating is the risk of a damaged reputation. If cyber criminals distribute malware-laden software under the guise of a legitimate brand, the damage can be lethal to the brand owner’s business. 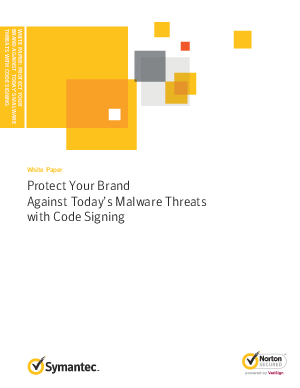 Code signing is an industry-recommended and widely-used defense against tampering, corruption, or malware infection in software code. As a powerful method to both identify code and assure the identity of the code signer, it builds trust with anyone using the software.